Once view properties have been encoded in a string that is hardcoded in the application sources it becomes difficult to locate them during some re-engineering of the code. As the application grows a more complex encoding might be required, but locating and substituting Urls spread all over the code is an almost impossible task. There is a standard protocol to substitute the dynamic pages of a SPA with static “page snapshots” produced by the server whenever the SPA is visited by a search engine. See here for more details. The above circumstances makes SPA attractive also for standard Web Sites that needs search engines indexing. For this kind of SPAs Urls play the same role they have in standard Web Applications. Namely, they furnish a way to reach all pages that compose the application and, together with all semantic tags, they help search engines to classify properly all pages. The Url based ko.routing router was conceived as an attempt to keep the SEO advantages of standard Urls while overcoming all disadvantages of keeping information encoded into strings (Urls). ko.routing may compute dynamically all Urls starting from all parameters that must be encoded in the Urls themselves. This result is obtained by “inverting” the routing rules. The router action method, and the related knockout.js action binding accept the parameters to be extracted from an Url and build the Url that would yield exactly those parameters. They are very similar to the Asp.net Mvc Url.Action method, and have the same purpose of keeping the code completely independent from the routing rules. The 1.2 release of the Data Moving Controls suite added the support for ko.routing, and offers also SPA project templates based on ko.routing, namely: SPA_Mvc5_ko.routing.vsix and SPA_Mvc4_ko.routing.vsix. In this post I’ll revisit the Data Moving SPA with a Context-Dependent Menu tutorial with the new ko.routing based visual studio templates. The main difference is that now all menu items will contain actual links with actual Urls. Select the WebApi 2/Mvc 5/ko.routing Single Page Application project template instead of the WebApi 2/Mvc 5/Single Page Application template. Attention: you must install both vsix in VS 2013 since only the second vsix contains the SPAView and SPAModule item templates. 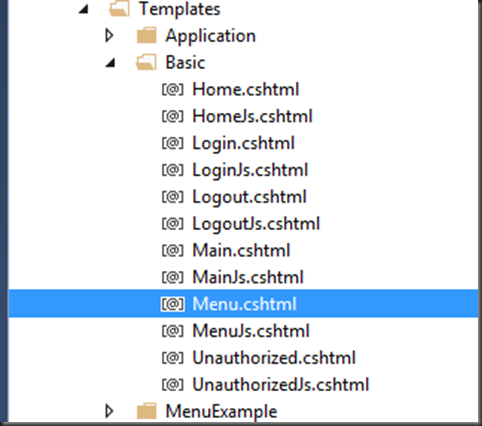 Each menu item stores both the computed Url and the original parameters used to compute it, since the parameters are needed to verify if a menu item Url refers to a SPAView the current user has the right to visit or not. Moreover, the original parameters help in verifying if the current SPAView is an instance of the SPAView referenced by an item menu, with some possible input parameter more(simple string comparison between two Urls is able to verify only if both Urls reference the same SPAView with exactly the same input). The client template used to render each menu item is selected by calling a template selection function that receives the menu data item as argument. In order to ensure the maximum flexibility each menu item has its own template selection function. However if no item specific function is passed, the default template selection function passed as an argument to the menuBuilder constructor is taken. The down method moves the fluent interface to the definition of the sub-items of the current item, and the up method returns to the definition of the father item. Finally the get method yields the final object tree. that creates all needed knockout observables an put the new modified model in the ViewModel Content property. The ExtendedClientMenuFor Html<T> extension declares the root menu items collection, the property that contains the level 0 menu items, and the menu data item property that contains the “action” to execute when the menu item is selected.Then, ExtendedClientMenuFor returns a fluent interface to continue the menu configuration. The root Menu ul tag contains the mainmenu Css class that defines some <ul> and <li> structural properties, and that removes underlining from all menu links. Then we declare which item property contains the target where to open links, and the various menu items radiuses (see the picture that shows the three radiuses here ). The way each menu item is rendered is defined by 3 templates, that are configured inside 3 AddRowType()-EndRowType() blocks. All templates have an unique column based on a custom template. The addition of the GenericClasses.NoWrap Data Moving predefined Css class prevents menu item titles from wrapping. The ChildCollection call in the last template causes the recursive rendering of all children sub items contained in the Children property. All AddRowType blocks define knockout client templates. Their names are obtained by adding the postfixes ‘0’ and ‘1’ and ‘2’ to the template base name “Basic_MenuItem” declared with TemplateBaseName. It is good practice to give names of the type <module name>_<a name> to all client templates used by controls declared inside SPAViews. The selection of the right template is performed by the template selection function declared with TemplateSelector. In our case a function declared on line recalls the default template selection method previously defined in each menu data item. That’s enough to see the menu working! Now you may run the application and enjoy your Menu! Since all default routing rules use the default action function our call must be placed only there. The default action uses the view, module and role parameters to create a virtual reference and then passes all parameters extracted by the Url as input to the SPAView (Input property of the virtual reference). Then the virtual link is used to fetch the SPAView from the default page store. If an instance of the required SPAView with the specified role(if any) is already stored it is returned, otherwise a new fresh copy is created (and stored) by the page store possibly downloading the required module from the server. Finally, the newly fetched SPAView is inserted in the main page host (applicationModel.MainContent). The .select call is wrapped inside a setTimeOut to ensure it be executed only after that all IContextDependent implementations (in our case just the menu) have been loaded when the SPA starts. Both methods call two private recursive functions that traverse the menu data items hierarchy to do their job. They are exactly the same of the ones defined in the Data Moving SPA with a Context-Dependent Menu tutorial. Otherwise the reclusive selectMenu function tries to locate a menu data item matching the action string. If such a data item is found the menu item it is bound to is set in the selected state by calling: mvcct.html.menu.selected(item, true)and the data item itself is returned in the res variable, so it may substitute the previous currentSelected. If the selectMenu recursive search fails, null is returned in res, and any previously selected item is unselected by calling mvcct.html.menu.selected(currentSelected, false). It is worth to point out that each time we make invisible a menu item we call the mvcct.ko.unfreeze to release any possible cached template, since most of Data Moving controls cache templates instances to improve performance. The selectMenu function compares the set of parameters of each menu item with the set of parameters that identifies the current SPAView. If the current SPAView contains some parameters more, the comparison is considered successful since those parameters are further specifications of the input contained in the menu item. That’s all for now! The full code is available in the “ContextDependentMenu_ko_routing” file that may be found here and in the Data Moving Plugin Examples Codeplex site download area. The Visual studio solution must be activated by installing the DataMovingPlugin5Examples.x.x.x.nupkg file you get with the product.